Paolo Villaggio interpreting the accountant Ugo Fantozzi. Today Paolo Villaggio passed away. Per-se, this is not big news. The Italian actor, author, director and comedian was 84 and he was not well known outside of the peninsula (and of course not everyone within it liked him!). The news, however, unsettled me for a simple reason: although Villaggio will be remembered also for his collaborations with Fellini and Olmi among others, to me he was relevant because he introduced me to Marxism and provided a convincing representation of what class struggle was all about. His passing away leaves me with a sense of melancholy, perhaps amplified by the dull and grey sky of this early July morning in Wales, where I live. The ‘ragioniere’ (accountant) Ugo Fantozzi was the most famous character played by Villaggio. Fantozzi came to the fore in short stories published in two major magazines in the late sixties (l’Espresso and l’Europeo), to then be brought to screen by Villaggio in a number of popular films – about 12, from 1975 to the late 1990. Not all of these films are not worth a mention: filled with banal jokes and crass situations, they are not the reason why I am recalling Villaggio’s here. Some of those are, however, true gems that deserve appraisal and consideration. The best one, and the one I would like to recall in these lines, is the first of the series – simply titled Fantozzi. The film shows the tales of Ugo Fantozzi, an accountant working for a multinational company in Genoa, the norther Italian city where most of the story is taking place. He is a mild, clumsy weak man, a very low-rank white collar harassed by his bosses and colleagues, dogged by all kinds of misfortunes and tragedies. Fantozzi is vexed by his own life and he can’t do much to get out of his misfortune: his tragicomic status – to use an hyperbole that he might have used – is apocalyptic. The guy does not, however, accept his destiny but tries everything in his power to change his condition. What is interested to me is not what he does, but what he is after: Fantozzi does not want to be a better man, or even a successful one, but all he wants is to be respected as a human being. Fantozzi is after dignity: at home, with his dysfunctional friends and, most importantly, in the workplace. It is there that Paolo Villaggio’s critical contribution lies: in showing the hierarchical structures and psycho-bureaucratic means by which the ‘Megaditta’ (Mega-company) is able to control and exploit Fantozzi and his colleagues. Villaggio does not point his critical analysis toward the character he created, which would have meant to wrap the ‘ragioniere’ in self-commiseration typical of the Italian Catholics’ pitiful approach on the less fortunate (which was definitely the most common at that times in Italy). Rather, Villaggio shows how the ‘ragioniere’ is only a misfortuned product of his own context, that of the emergent Italian corporate culture of the post-60’s boom: an industrial society of mass consumption that, like Fantozzi and his colleagues, is attracted by commodities like beautiful cars and utilities but at the same time remain attached to quintessentially Italian paraphernalia like football, pasta and sexist jokes. Fantozzi is a patchwork emerging from that (apparently) ascending provincial life and he is, in this sense, the best son of his times: a caricature of common subjective traits emerging from that Italy and that mode of production and concumption. 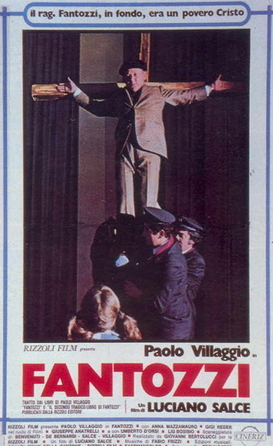 After all Fantozzi is – as the film poster above states – just a ‘povero Cristo’, a ‘poor Christ’, meaning with that an innocent victim of the system he lived in (and one should not overlook the ironic critique of Catholic’s dogmatism and symbolism contained in that poster’s image, which was an important part of all Villaggio’s writings). The masterpiece of all Fantozzi’s tales is contained in the first five minutes of that first film. There we see the young ‘ragioniere’ waking up in his home and getting prepared to go to work. Everything is organised to the finest details: Fantozzi has only a few second to wake up, eat his breakfast (while comping his hair), fulfill his physiological needs in the ‘European record-time’ of six seconds, and finally get dressed with the help of his wife Pina. When, however, a shoe lace breaks, Fantozzi is forced to hurry up in an unconventional way to catch the overcrowded bus that will bring him to work. Ceased by a crowd of angry peers that he inadvertently pulled out of the bus, Fantozzi reaches the Megaditta in a ‘ridardo mostruoso’ (monstrously late) and he has only a few second left to stamp his working card in time. His epic running against the factory’s clock, surrounded by colleagues that do no help him otherwise he will get ‘squalificato’ (disqualified from the competition), is one of the best scenes that Italian’s cinema has ever produced. To get in time to work, Fantozzi has organised his early mornings actions around Taylor’s scientific model: as a series of repetitive action to be completed in a specific time. Errors or unexpected occurrences are not tolerated an they must be dealt with in radical and life-threatening ways: Fantozzi has to climb his balcony and throw himself onto the street as much as shortcuts and out-of-the-box ‘solutions’ are implemented in factories worldwide in the name of efficiency (which of course equates with the capitalist’s profit). The ‘ragioniere’ wants to be efficient too and he does not want to arrive late at work: the reprimands he would receive otherwise and the consequences on his salary would be intolerable for him. The same goes for the other white collars whom he inadvertently pull out of their overcrowded bus. They have no time and no emotional capacity to understand Fantozzi – there is, in a sense, no possible solidarity for him and with him: the workers start to beat each other and to punish the weakest one in the chain, our beloved accountant. 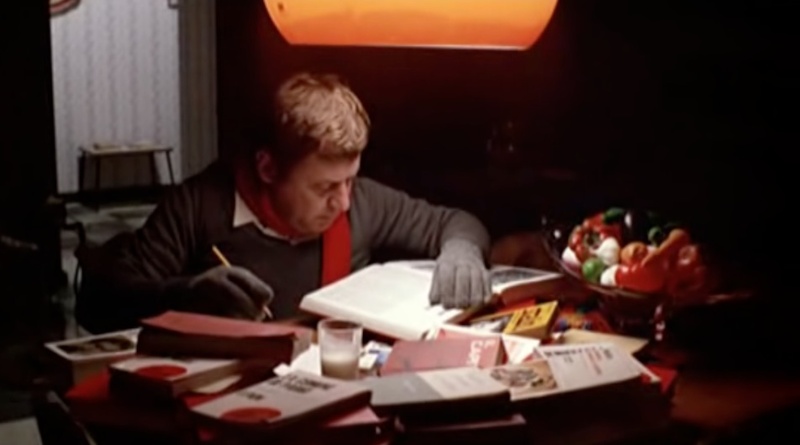 Similarly, no solidarity is possible in the final epic run either: Fantozzi is alone against time, in competition with his own peers, exhausted by life – and its peculiar mode of production – already at 8am on a Monday morning. In those five minutes there is the best popular representation of a Marxian critique to industrial capitalism that I ever saw in my life. We get the extension of factory life into domestic life in terms of timing and division of labor; the alienation from one’s own Gattungswesen (spiece-essence), meaning the disenfranchisement of Fantozzi from any other aspects of his life that is non-work related; the lack of solidarity among citizens-workers (Fantozzi’s peers in the bus) as well as the lack of solidarity within the factory itself, where Fantozzi can’t be helped or the bare rules of the ‘competition’ (the rules of production) would be invalidated. This is pure critical analysis translated into cinematic comedy for the masses: that capacity to reach the many in a comprehensible yet still critical way is, to me, what an intellectual work of the highest standard should be about. Those five minutes and some other parts of the Fantozzi’s series made me aware – when I was a teenager, unconsciously and without any theoretical presumption – of the subtle mechanisms leading my father to come and go from our home at absurd hours, often working the 22:00-6:00 shift and then the 14:00-22:00 shift in a row to get the better possible pay as a factory worker at FIAT; of the power-structure and domestic division of labor affecting my mother, caring for us while at the same time being confined to informal cleaning jobs around the ‘alta Padana’ (the region where I grew up); but also, later on, of the inadequacy of most of the institutional education that I received in the depressed provinces of the North where we were never exposed to any critical theory or thinking. I am so attached to Fantozzi because it was through him that myself and many of my 80’s-born-peers had their first, nuanced and provisional encounter, with a politicized analysis of the selfish and exploitative society we were growing in. The ‘ragioniere’ approaching Marx’s texts for the first time in his life (1975). There is one last reason for which I find the ‘ragioniere Ugo’ compelling. It is that despite all his clumsiness and misfortunes he does, from time to to time, rebel to the system that has framed him and condemned him to his status as nullity. 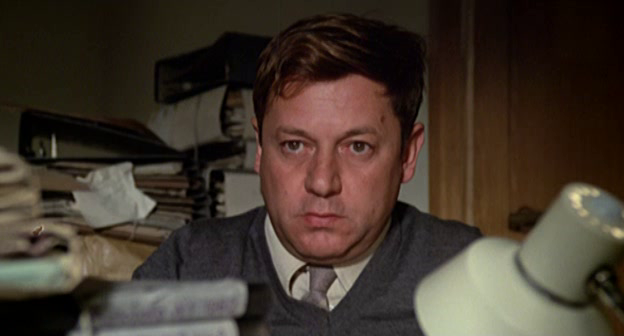 Fantozzi might be slow and perhaps a bit dull, but when he is cornered he gets angry: he starts to question his bosses, to organise with his peers and, at a certain moment, even at reading Marx itself. Deep down in his political conscience Fantozzi is still alive and he knows that something – bigger than the value associated to his labor – had been stolen from him. Paolo Villaggio was not, however, one to concede unnecessary happy endings. 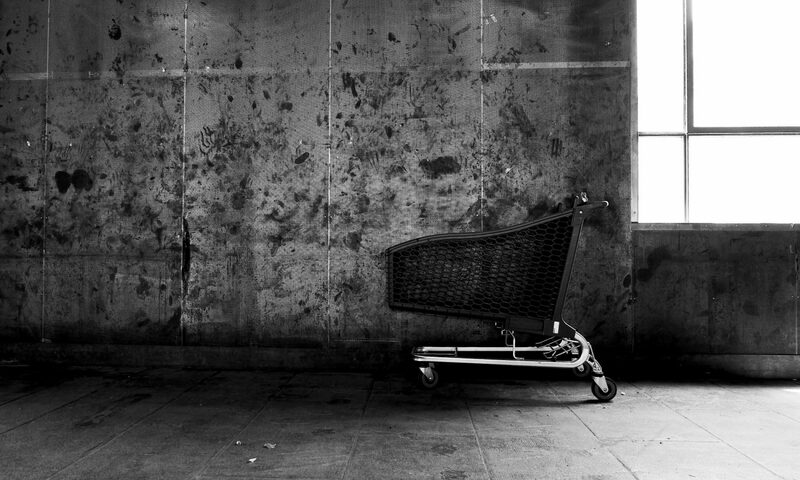 He knew too well that somebody like Fantozzi could had not, alone, overturn the machine. This is why Fantozzi is never successful in his attempts: his own bosses are always able to talk him back, approaching him with persuasive voices that speak of compromise and loyalty to the ‘Megaditta’, which in turns leave him constantly in a worse position than before. Mega Direttore Galattico: Ecco, bisognerebbe che per ogni problema nuovo tutti gli uomini di buona volontà, come me e come lei, caro Fantozzi, cominciassero a incontrarsi senza violenze in una serie di civili e democratiche riunioni, fino a che non saranno d’accordo. Fantozzi: Ma, mi scusi Santità, ma in questo modo ci vorranno almeno mille anni! Fantozzi: But in relation to all these requests and all the injustices that we witness, what do you recommend to do, your Majesty? Mega Direttore Galattico: Here it is: for every new problem, all the goodwill men, like me and you, my dear Fantozzi, they would have to begin to meet without violence in a series of civic and democratic gatherings, until we will all agree on the same point. Fantozzi: But, I do apologize your Holiness… But in this will take at least a thousand years! Mega Direttore Galattico: I can wait. Although not all of Villaggio’s production is of the same standard – and despite the fact that many critical points could be raised by a number of his statements or artistic choices – the first and second of Fantozzi’s film will always remain powerful representations of personal and class alienation, both in Italy and elsewhere. I learnt a lot from ‘il ragioniere Ugo’ and I am grateful to Villaggio for having used popular comedy in such a meaningful critical way. Tonight I will cheer up to him with a traditional ‘frittatona di cipolle e famigliare di Peroni gelata‘ (onions omelette with a big bottle of Peroni — although it sounds better in Italian! ).